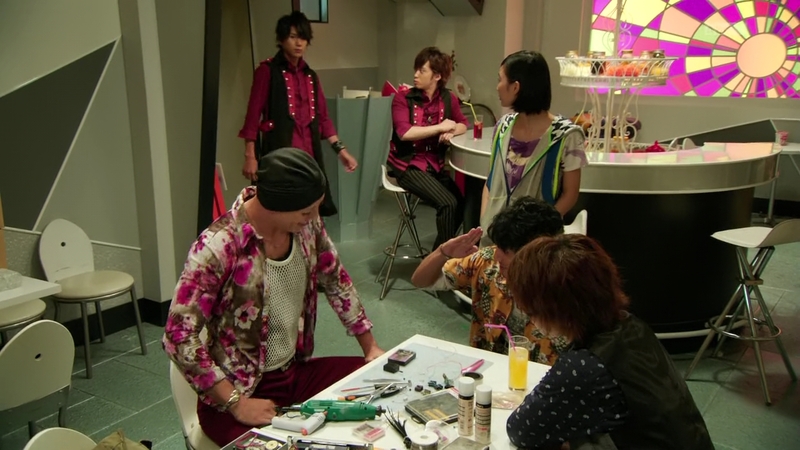 At the Garage, the others wonder what could have happened to Kaito. Maybe he ate one of the fruits. But Oren says that’s odd since he thought one loses their sense of reason once they turn into an Inves. 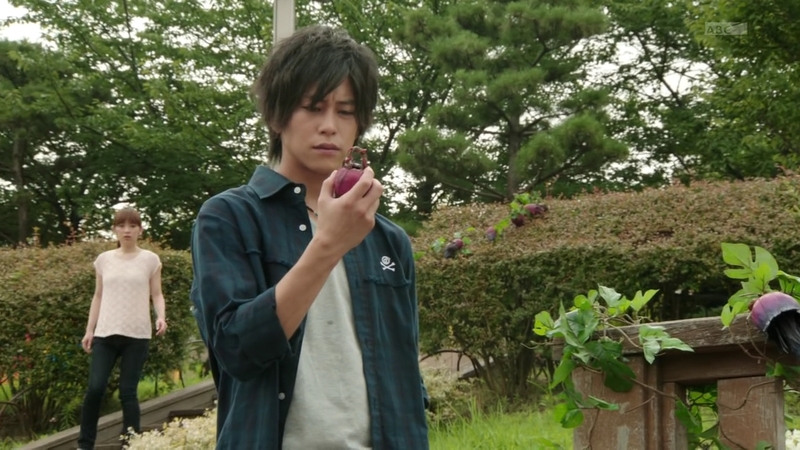 Kota then remembers Kaito’s fascination with Roshuo’s and the Golden Fruit’s power. 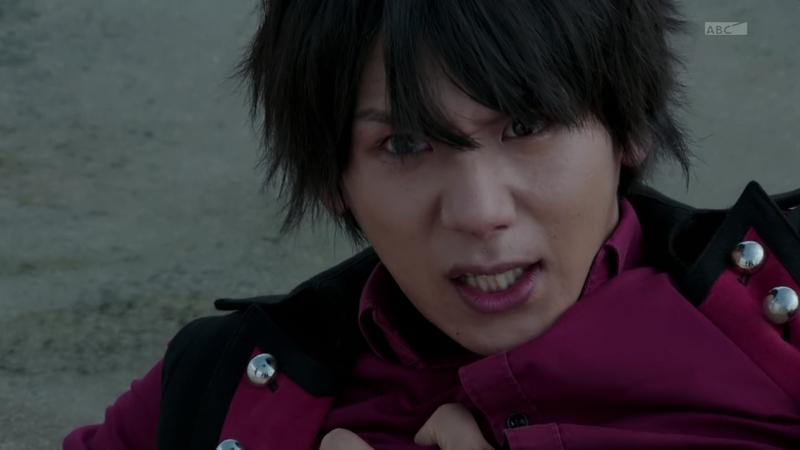 Oren says Kaito is not someone they can face while injured, but Kota says his wound is healing quickly. Maybe too quickly, the others wonder. 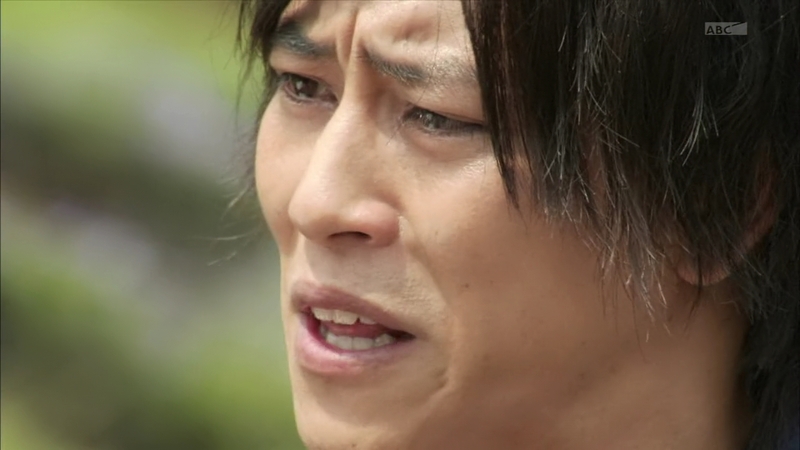 Kota shows them the Kiwami Lock Seed and says maybe it’s because of that. 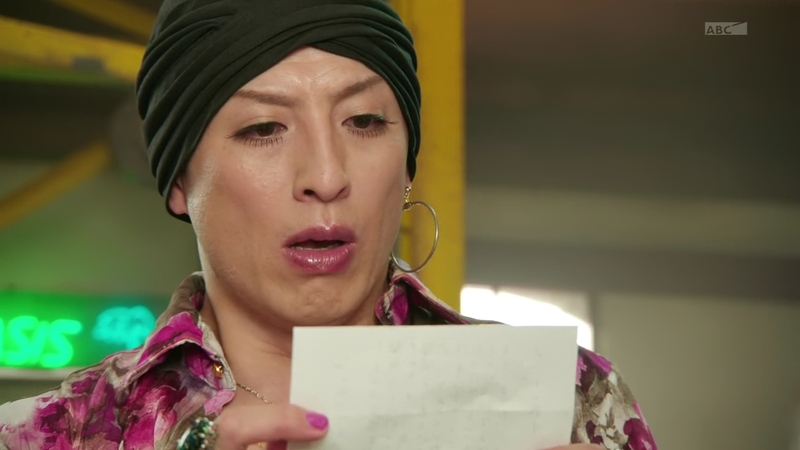 Peco returns and slips Oren Zack’s note. Back at the hospital, Mitchi is still beside himself. But this time, he’s crouched up on the operating table instead of the floor. He sobs thinking about how everyone has left him. 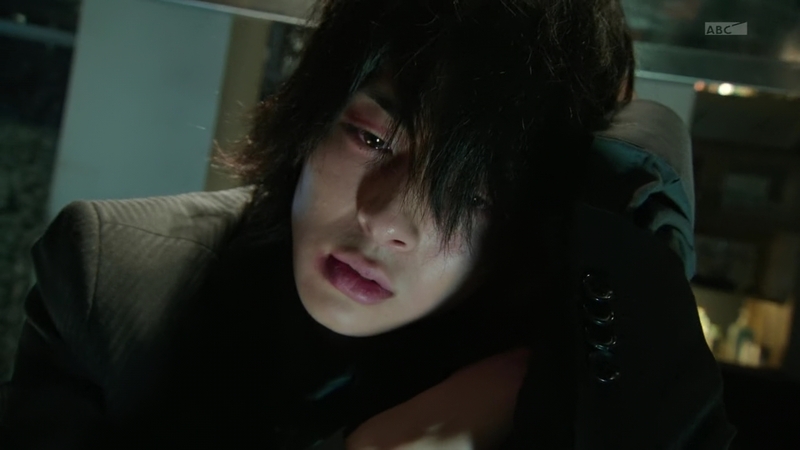 HeadTakatora appears and tells Mitsuzane that the others didn’t leave him, he just stopped moving while the others moved forward to face their own destinies. 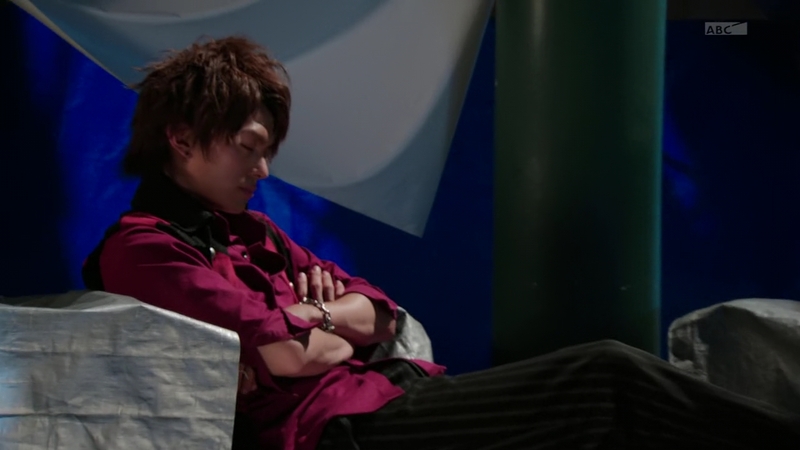 Minato and Zack watch King Kaito in deep sleep. So deep, he is able to talk to Beginning Mai. 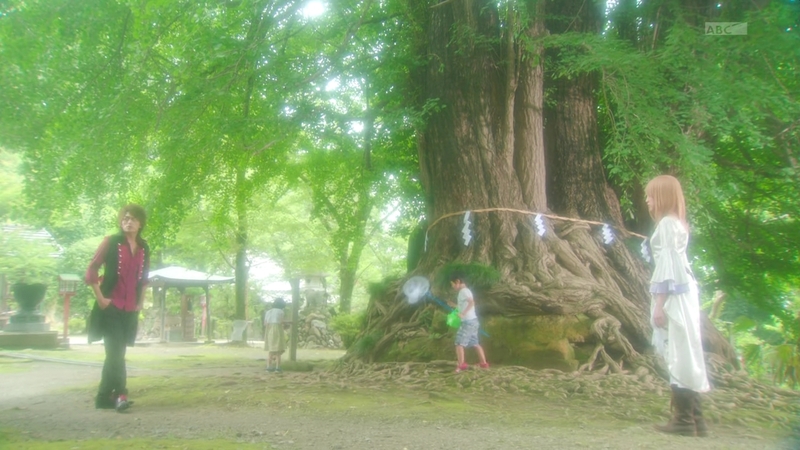 They are at the sacred tree of the Takatsukasa Shrine. 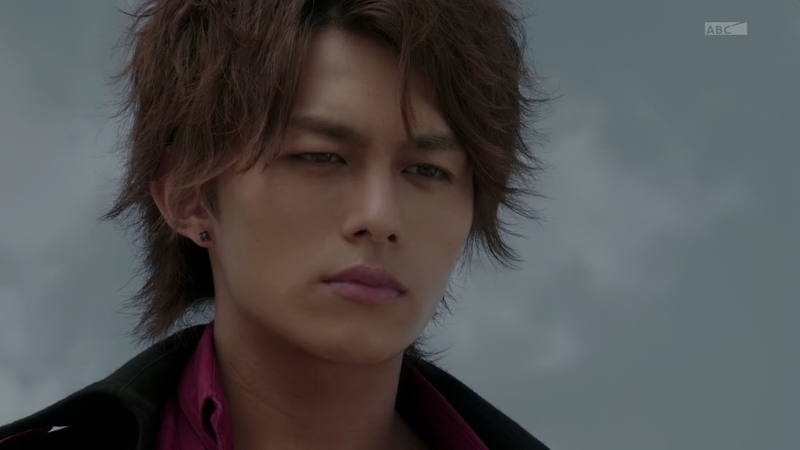 Kaito realizes Sagara was telling the truth, Mai is not dead but she awaits him in the future. Indeed, Mai says, a future that has been laid waste where the weak are gone and only the strong survive. That’s how Kaito prefers it. Those who gain power by stepping on the weak are doomed to the same fate when they face those even stronger than them. Is that what you wish? Mai asks. The others are at Drupers as Oren uses his mercenary past to fashion a bomb. Zack arrives and Jonouchi comments on how strategic it is for Zack to get close to the enemy by pretending to be his ally. 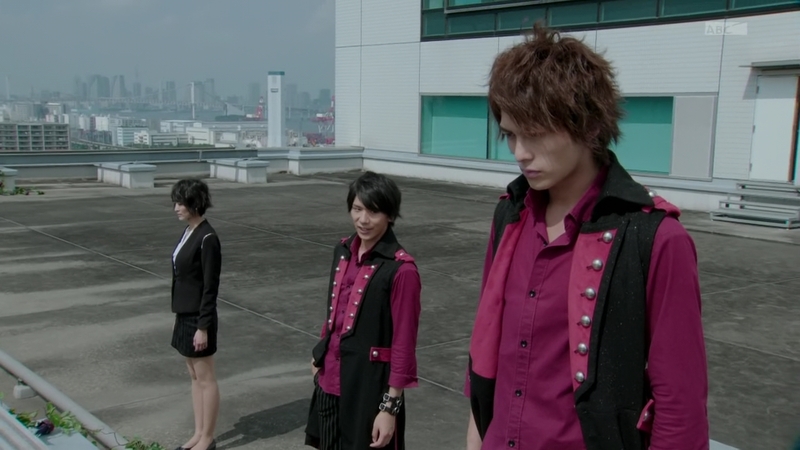 Zack leaves and joins Kaito and Minato on a rooftop as they marvel at the Inves army below. “What’s the point in destroying the world?” Zack asks. 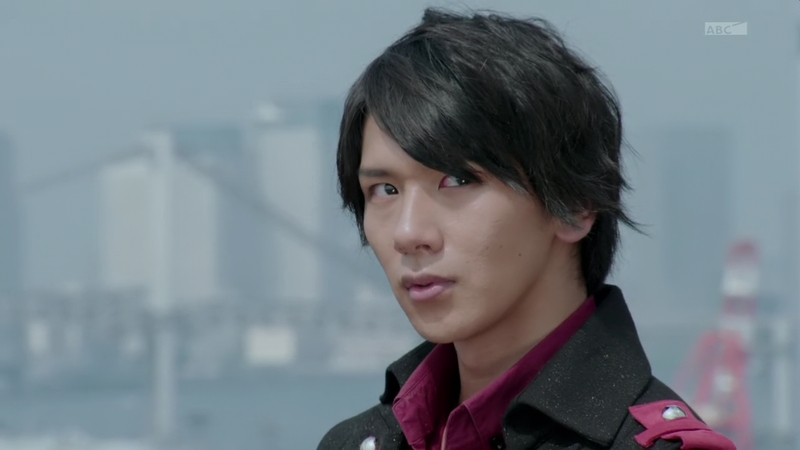 I have no one left to protect or lose, Kaito says, so there’s no one left who can beat me. “In the end, you haven’t changed at all.” Zack turns to leave, but first he places the bomb under an electrical box behind Kaito. Minato senses something is off and turns to see Zack pulling something out of his pocket. She rushes to grab his arm and they tussle, causing the detonator to fly out of Zack’s hand. 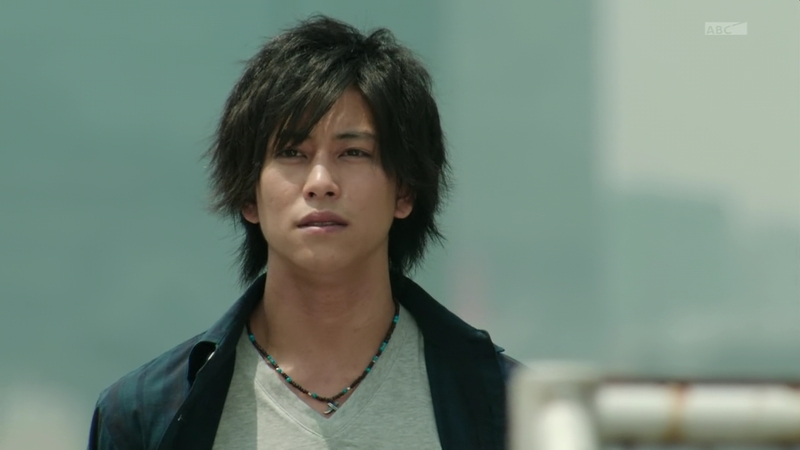 Zack hurries to grab the detonator, but Minato rushes over to Kaito. She henshins and pushes Kaito out of the way, absorbing the huge blast as she gets thrown off the side of the building. 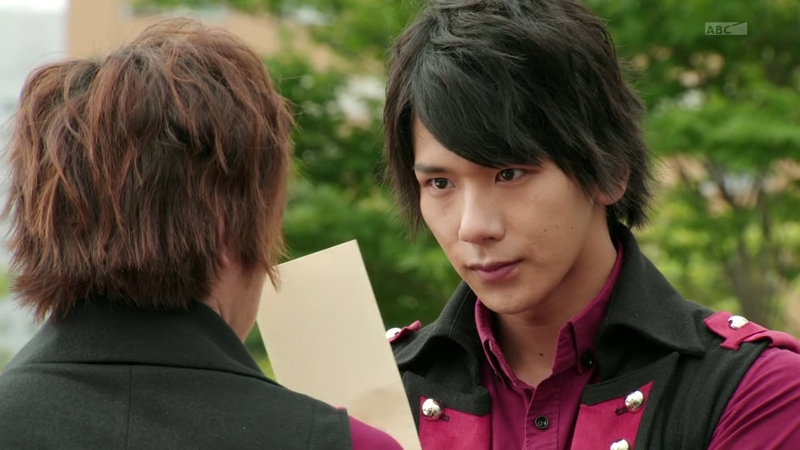 “It is my duty to do this.” Zack henshins, as does Kaito. They battle as Zack says he’s got something to protect, to fight for. 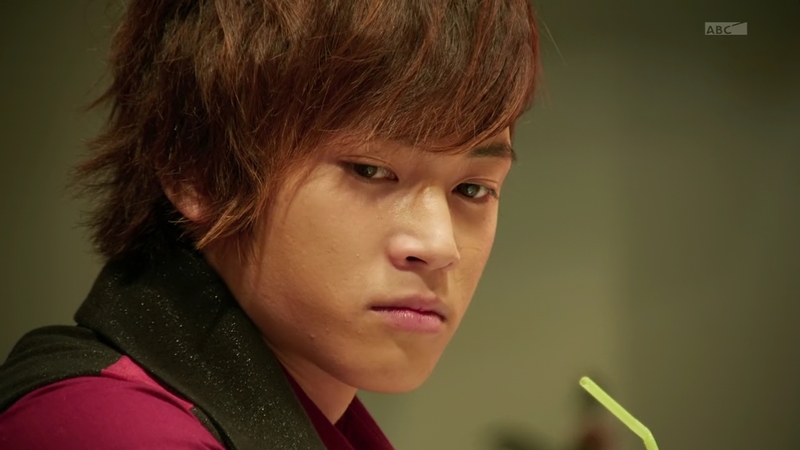 Kaito acknowledges that Zack has become stronger, but delivers a Banana Squash and forces Zack to de-henshin. His Driver and Kurumi Lock Seed are now fried. 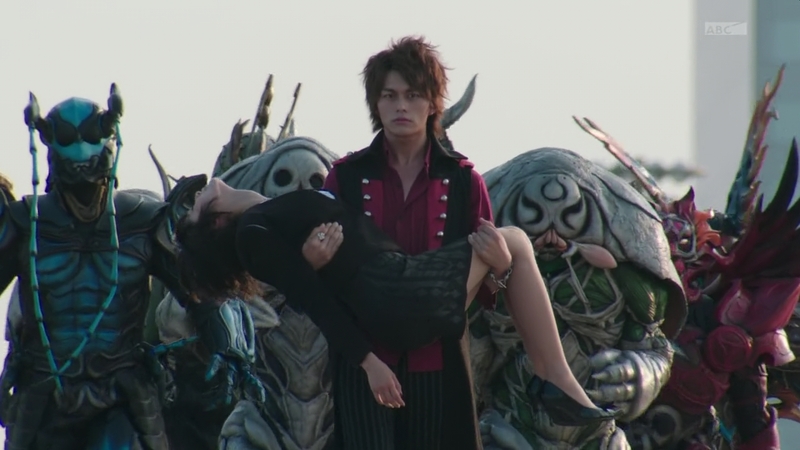 She takes her last breath and Kaito carries her through the streets of Zawame with the Inves army behind him. 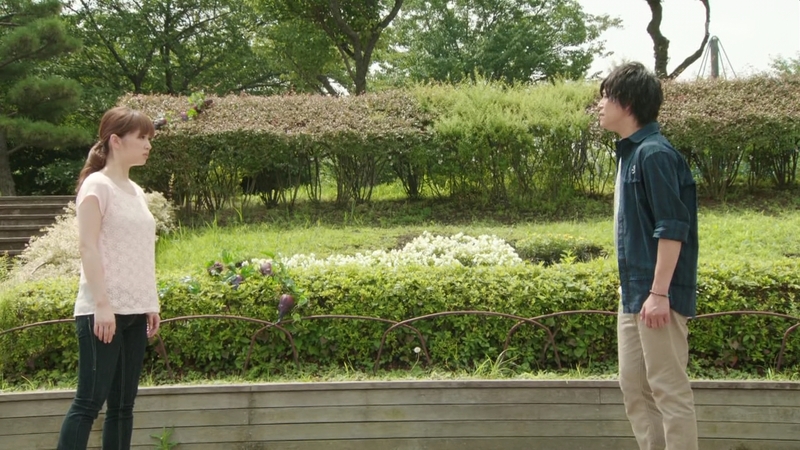 Meanwhile, Akira catches up to Kota walking in the park. She sees him about to take a bite out of the Helheim fruit. They are both in tears, but they turn when they hear the sound of helicopters approaching. The commander says the evacuees told of Beat Riders who had helped them get safely out of Zawame. Now they will be taken to safety as well. 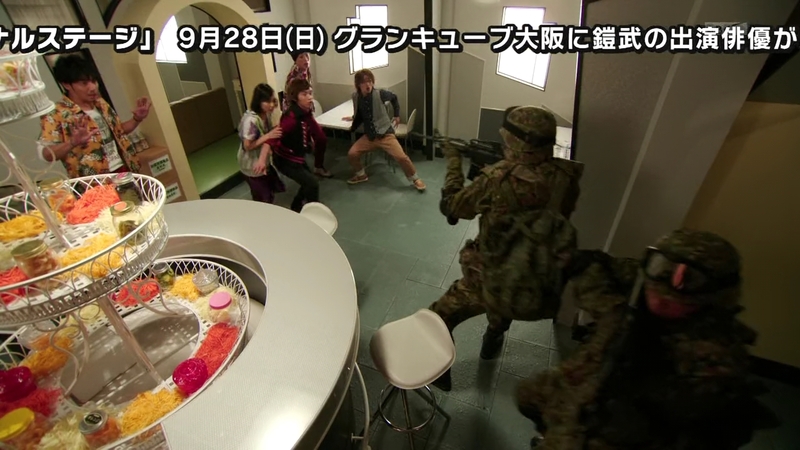 Peco wants them to go check on Zack, but the soldiers tell them that they must return in five minutes or the helicopter will leave without them. Chucky says Kota and Akira are still out there as well. But the commander wants to make sure that none of them have eaten the fruit or have plants sprouting out of their wounds. 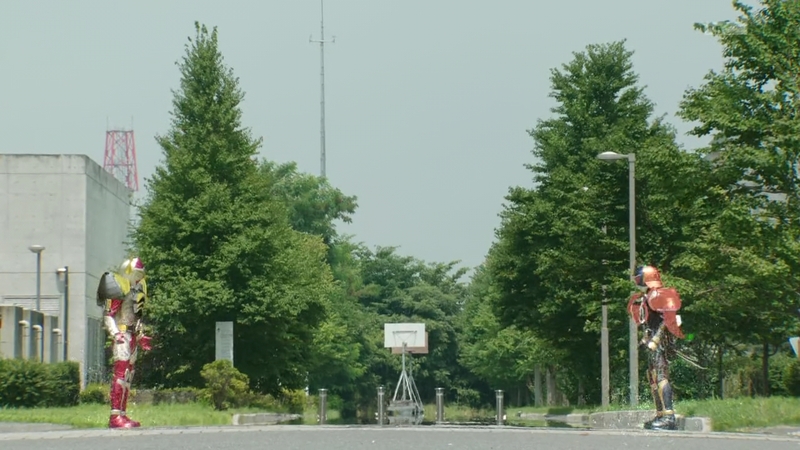 Kota and Akira run toward the helicopter and see the others getting evacuated. “So we weren’t abandoned,” Kota says. 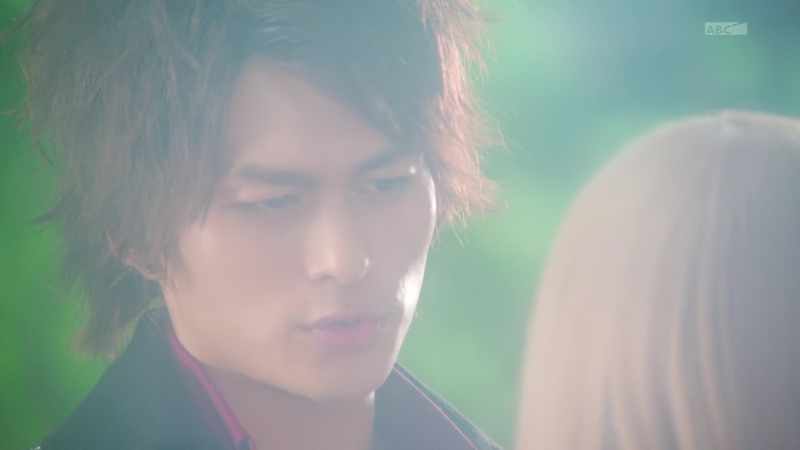 Akira starts to run ahead, but turns to see Kota has paused. 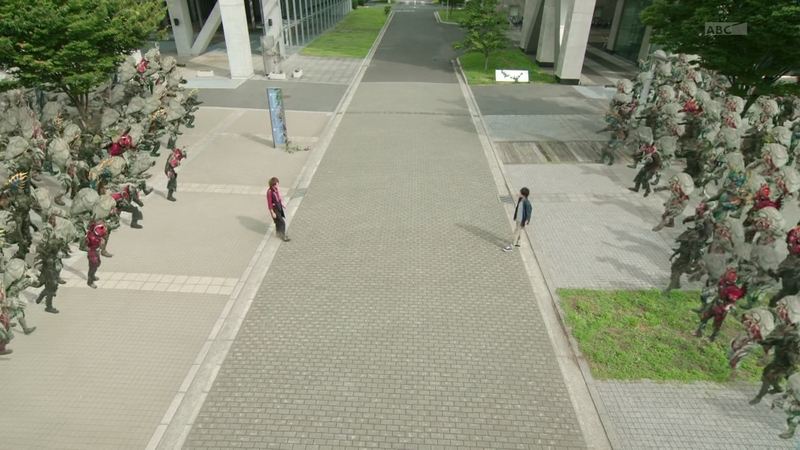 Akira calls after her brother as he runs off. 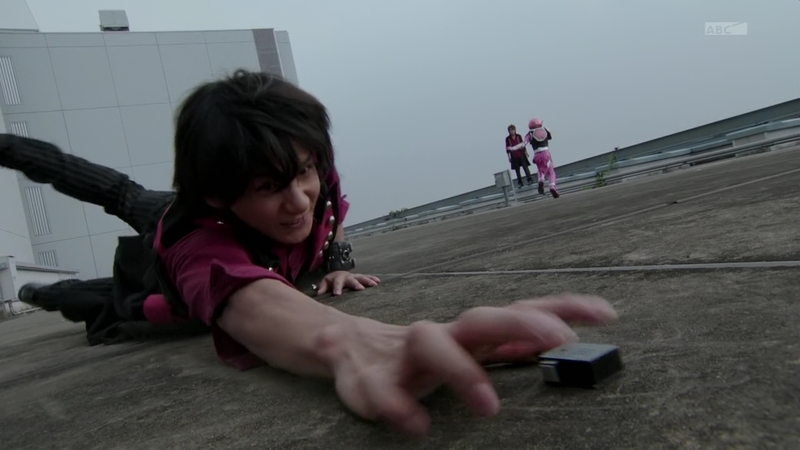 Kaito waves his hand and his own army of Inves falls from Cracks in the sky. 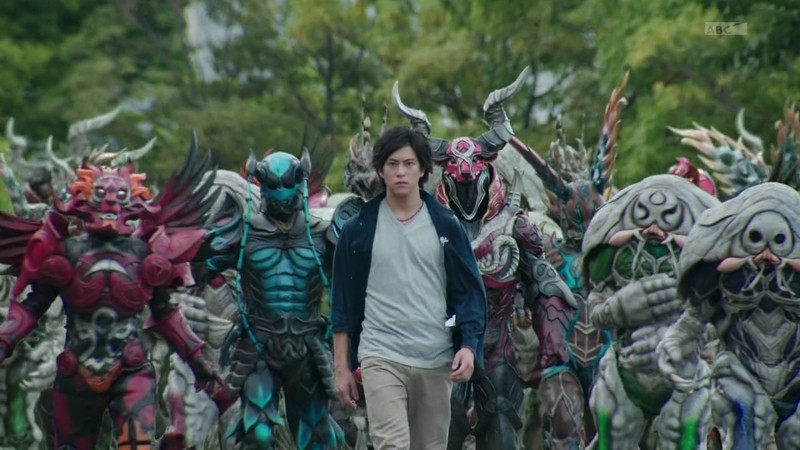 Kota and Kaito come face to face, each flanked by their own armies of Inves. “I knew you’d be the one to get in my way in the end,” Kaito says. You’re saying our world is hopeless? Kota asks. 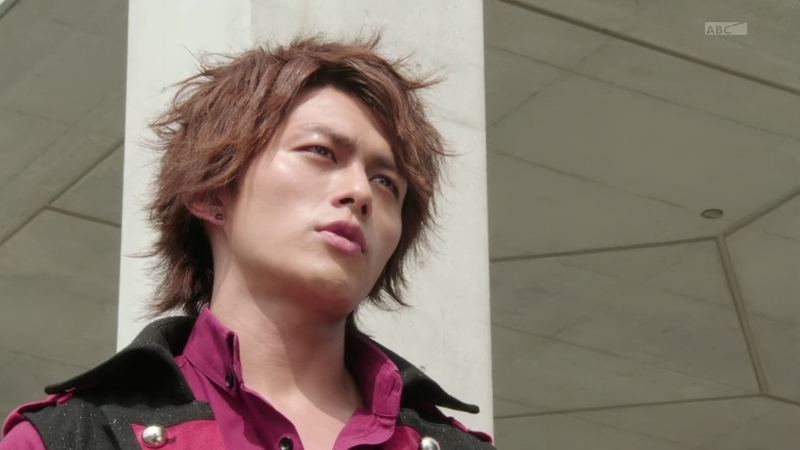 Kaito says their own history, his own life is proof of that. The stronger people grew, the less kind and compassionate they became. Kota insists there are plenty of people who are both strong and kind and they are desperately trying to protect this world today. 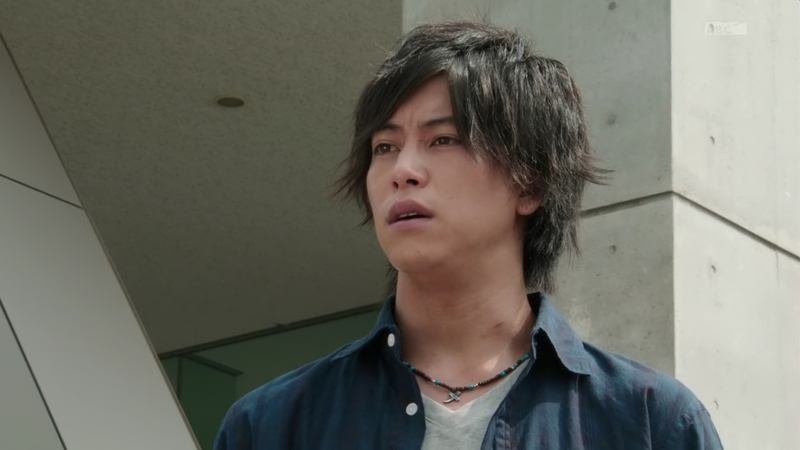 Kaito says those people are the ones that died first because they didn’t have true strength. Like Kota. 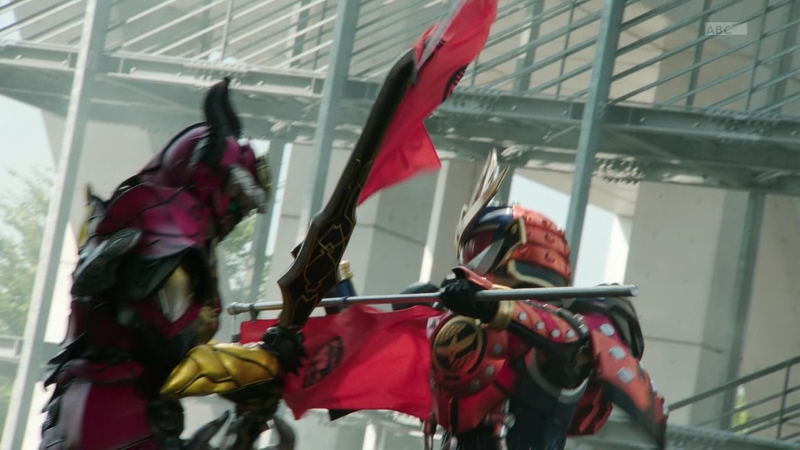 They both henshin and fight with the Inves in a free-for-all around them. Kota and Kaito hop on their bikes and hovercrafts before going Jinba Lemon and Mango. Just kill everyone, why don’t ya?! I’m not going to count Zack dead just yet (or even Minato or Ryoma for that matter). But damn that was a great scene. Zack passively confronting Kaito and his questionable motivation and still being resolved to blow his former friend to bits was really well done, I thought. Then there’s Minato sacrificing herself for the guy, we can assume, she ultimately fell for (well, literally and romantically). 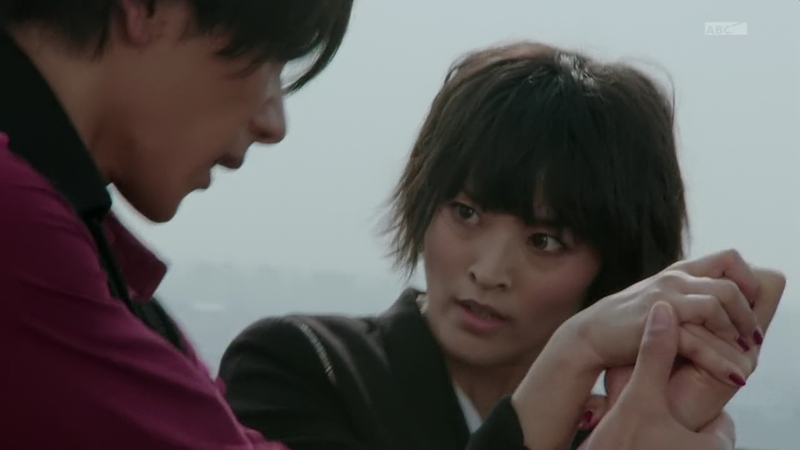 I can see some reciprocation of the feelings from Kaito when he takes her in his arms. Not so much that he’d forget fruited Mai, but at the very least a small tinge of appreciation for the woman and really maybe the only person who saw him for his potential. I loved that Kota-Akira scene. I’ve been longing for more and longer sibling scenes. I want my MaGMCMs and Kota basically telling his sister to “GO! Save yourself Neechan!” would definitely get my eyes watery. Just like how those scenes of the others getting saved by the troops and Kota realizing that no, they haven’t been abandoned were. HeadTakatora telling Mitchi to make something of himself after his self-pity party… oh boy, I can already see where that’s heading. The melee at the end was kinda pointless outside of Kota and Kaito, but insanity like can be fun to watch from time to time. But man, just one episode left. (I’m expecting Episode 47 is some kind of one-off, Drive-teaser like last year’s Wizard extras, right?) What an amazing ride this has been. Whoa drama episode. So Kaito went psycho (and all this time hoping not to) any then tells Mai to become his?! Just like Micchy. But in the theme I’ve always noticed that the bit with Kota and Mai underneath like a reflection it’s Kaito and The priest of Fate. 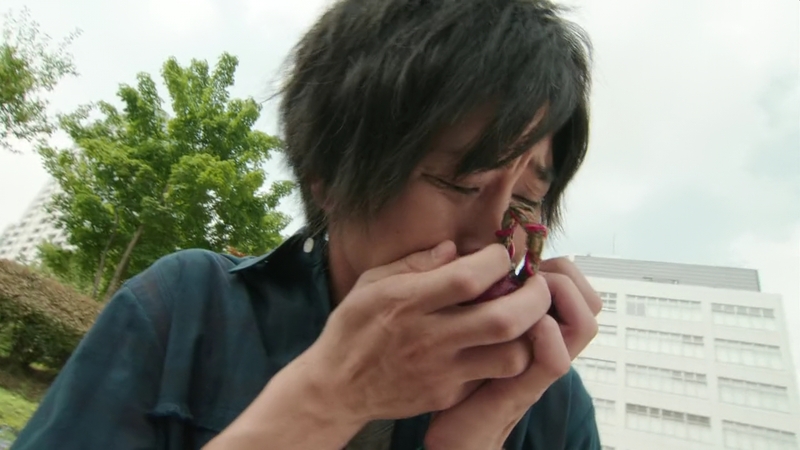 Yeah but the reasons why I like why I like this episode and episode 44 because this is going to sound weird and stupid but the reason why I like them because Kaito is doing this for Mai because he hid his feelings for her. 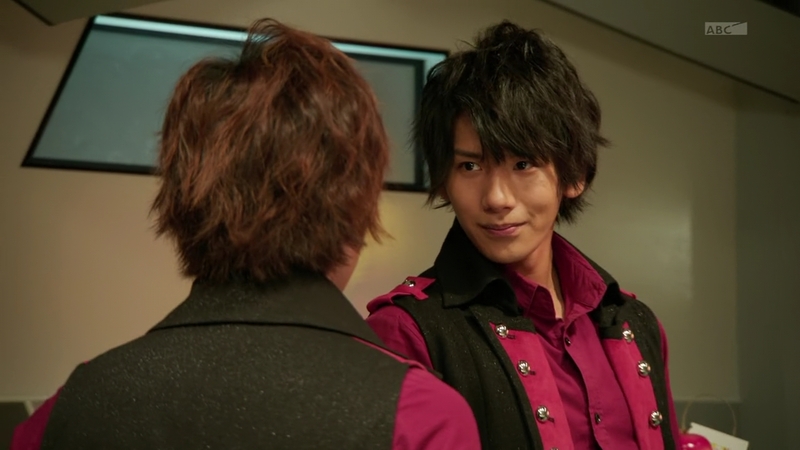 Everybody may have knew that Micchy had a crush on Mai and in episode 3 Gaim shipped Kota and Mai. Once Mai’s body disappeared the person Kaito wanted to save he went berserk Micchy went psycho even though Mai wasn’t lost in space.